RUTHERFORD, N.J., July 22, 2015 /PRNewswire/ — After almost a century of injustice, innocent car parkers of the United States have finally been given a voice. Jackass Parking Chalk, what the founders call “emotional expression utensils,” now provide frustrated citizens a product and platform to take on this all-too-common social crime. Two residents of New Jersey, the state with one of the highest percentages of inconsiderate parkers, decided to take matters into their own hands. 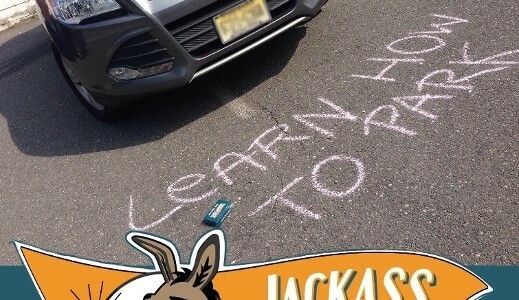 To solve this seemingly unfixable situation, the husband and wife duo developed Jackass Parking Chalk and an associated social sharing platform.